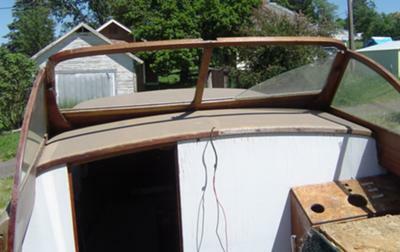 Rare Chris Craft boat in good shape, needing minor repairs and partial restoration. Wood in excellent condition except for a few pieces that need to be replaced. Top half of boat is varnished mahogany wood, hull side color is white. This is one of 498 built. Does run, but does not have original motor. Original motor was Hercules 6, but has flat-head V-8 for power plant. Can remove if not wanted. Has Burkley transmission and brass prop that is still intact. Must sacrifice $4500 obo, $3500 firm without motor. 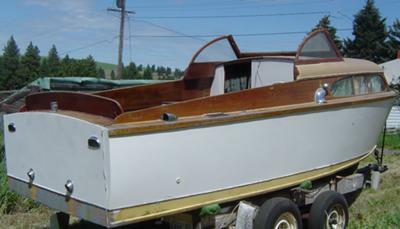 Once restored, boat is worth up to $40,000. Serious inquiries only, must sell ASAP. Call Brad 509-362-3752 or 509-569-3988. Sorry I have been away for awhile. I still have the boat and it is still for sale. Boat does come with trailer. Does need some restoration. the phone numbers don't work? I owned a boat just like this one from 1975 to 1984. The boat was a pleasure to run and operate. Mine had a 75hp Gray Marine flat head 4cyl. She used only about a gallon to a gallon and a half an hour, and with a fuel tank of about 30 gallons. She would also go fast enough to pull a skier. Inside of the cabin at the door was the head. The head had a small china bowl that sat upon a bronze pump that was pumped by hand. It dumped directly into the water. It was replaced with a self containing one because of new regulations. On the right in front of the helm inside the cabin was a little galley area, not very big. We replaced it and put a small bar sink with a hand pump and a 5 gallon plastic container that was rectangular to fit next to the ice box, yes thats right my Dad had one that was for travel or camping and it fit very nicely under the sink and made a nice little galley area for making easy meals. In front of that was 2 v berths which I had put new custom made cushions. In the aft if the boat was a bench seat that went all the way across the back , which I also had cushions made cushions. Their was not a helmsman chair so my Dad had a friend of his who was a welder make one for a case of beer. Out of aluminum poles steel angle iron and some old bronze door hinges off of an old shrimp boat. The seat had a back that would fold down, and take out the aluminum poles and the seat would fold down out of the way. The seats were all of matchimg blue vinyl for the outside, on the inside they were of bluegreen cloth. I got rid of the boat in February of 1984 after Hurrican Alicia of 1983, not because of the storm but because the company I worked for went out of business. If it was not for that I would probably still have the boat today. I did see one on the internet about 2 years ago just like the one here expect it was a 1952 model with a 6cyl. Gray Marine and was in very good condition with a trailer for around $8500. It was located in Minnesota. 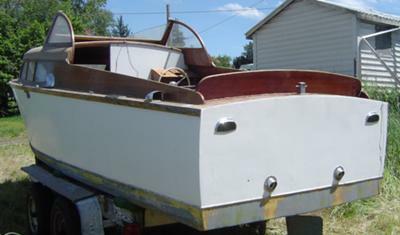 Whoever decides to buy the boat and restore it will have a very nice boat that will be as I would say about the one I had "a head turner" because of the spar varnished mahogany with the white hull. 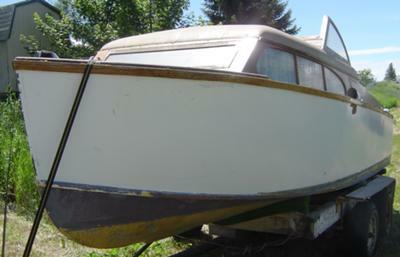 Good luck to the seller and lots of pleasure to the person who buys the boat and restores her,. Hello, my name is Ted and I have a very similar boat that I got from SF area. I can't find any markings on it but I have done extensive research to no avail. I would like to contact you and send some pics of my boat and pick your mind on this hull.